Richie Smyth’s The Siege of Jadotville premiered across Irish cinemas two weeks ago, on Monday September 19th, to a roaring success. It’s a thoughtful, clever film made with the aim of shedding light on a “corner of history,” as it was referred to during the premiere night’s Q&A session with the director Richie Smyth, screenwriter Kevin Brodbin, actor Jamie Dornan and producer Alan Moloney. As each of the four of them heard the story, they wondered why it was that these events in Irish military history had been swept under the carpet and went uncelebrated. This was all to change when Smyth, Brodbin and Moloney set about adapting Declan Power’s captivating account of the events, Siege at Jadotville. The “corner of history” they talk about is a largely forgotten moment of bravery displayed by Irish U.N. troops deployed to Katanga, the Congo, in 1961 for the purpose of peacekeeping. After the assassination of the previous Prime Minister Patrice Lumumba over political differences relating to the country’s natural resources and nationalisation, the country was in the hands of Moise Tshombe and Mobutu Sese Seko – who was to form an authoritarian regime in the country some years later. In order to protect the citizens of Katanga from potential danger, the U.N. arranged to deploy Irish soldiers, specifically because of Ireland’s neutral stance and lack of involvement in previous invasion activity. This is how the story of A Company, 35th Battallion began: on shaky foundations of international political unrest. During Monday’s post-screening Q&A session, the common theme of men in suits using troops on the ground for political advancement was discussed; an important idea to keep in mind when watching the film. 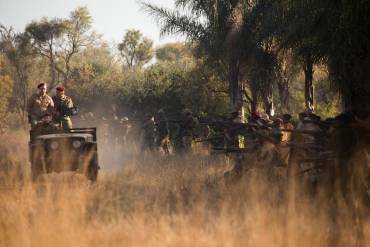 Cause and effect of the Jadotville events is illustrated over the course of the motion picture; short scenes featuring Conor Cruise O’Brien acting as director of the Katanga deployment are staggered neatly throughout the action. These scenes which underline Cruise O’Brien’s political motivations take place in clean, safe headquarters and are complemented by the messiness of what happens on the ground with the siege itself. The film carefully and cleverly draws attention to the gulf between the intentions and ideals of those in command and the reality of outcome. 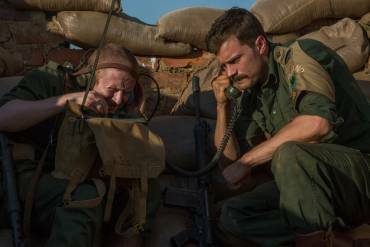 Cruise O’Brien is set up as an academic for whom “the world stands still” when strategizing, at the expense of A Company, who are abandoned without reinforcement at Jadotville. Sitting in the premiere, there was a tangible connection with history felt by all present. The surviving Jadotville veterans who lived through the reality of the siege 55 years ago sat in the audience watching with their families; enthusiastic cheers rang out at the various moments Pat Quinlan [Dornan] and his company succeeded against the odds, even in small ways, and cemented the feeling of community surrounding this small patch of Irish history. The bulk of the film focuses on the combat between the Irish A Company and Katangan troops, which is where the cinematography truly shines. As a viewer, you are immersed in the action and shown the reality of war through various perspectives. The reality of the dangers of armed battle pull the Irish soldiers’ bravery into sharp focus; it stands out as remarkable that all 157 men of A Company survived the siege, although they were significantly outnumbered. In this way, the film stands as a sincere tribute to the ordeal experienced by the veterans. The film’s producer, Alan Moloney, remarked upon the unique rapport and chemistry between the A Company men, this undoubtedly a significant reason for the whole group’s survival. The soldiers’ relationships with one another are represented particularly well in the film, making for a thoroughly enjoyable viewing experience; there are many lighthearted and genuinely funny moments scattered throughout which serve to bring the viewer closer to these characters and their struggles as well as providing some much needed comic relief. Many of the quips feel particularly Irish in character, and the audience at the premiere sounded its approval and recognition with peals of laughter. Although none of the soldiers bar Pat Quinlan [Dornan] are fleshed out much in terms of character, the joking shown among them creates a feeling of familiarity between the audience and A Company on screen. During the Q&A, director Richie Smyth mentioned the film as “anti-war” and even “anti-Hollywood” in nature, since none of the heroes die, in line with the real events in 1961. It’s certainly refreshing to see a film which subverts the classic Hollywood and war film tropes – in this feature, violence is not glamorous, but a necessary evil the A Company men must engage with in order to protect themselves. The filmmakers made this decision to remain true to Declan Power’s account and the true events 55 years ago, which makes it all the more dramatic and all the more powerful to watch. The Siege at Jadotville hits Netflix tomorrow on October 7th. Want to read it first? Get it here! Mercenary forces attacking the town of Jadotville. Example of the film’s beautiful cinematography.